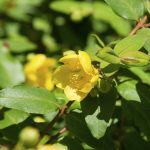 What Is Eating My St. John’s Wort? Something has infested my St. John's Wort plants, and I think it is scale but would like your input. The leaves are heavily invested (from the ground up) with a pin head size 'dot' that is orange/yellow in color and cannot be wiped off. . . on the underside of the leaf. The top of the leaves have brown dots where this thing has eaten from the under side. My plants were so healthy and it seems this has happened rapidly. What do you think it could be, and how should I treat it?